As a home improvement editor, I witness the amazing panoply of DIY crafts and decor that come to the surface of the blog-o-sphere this time of year. Ornaments made from old car parts? Check. Mantel displays that could put the professionally-decorated window of any Fifth Avenue department store to shame? Check. 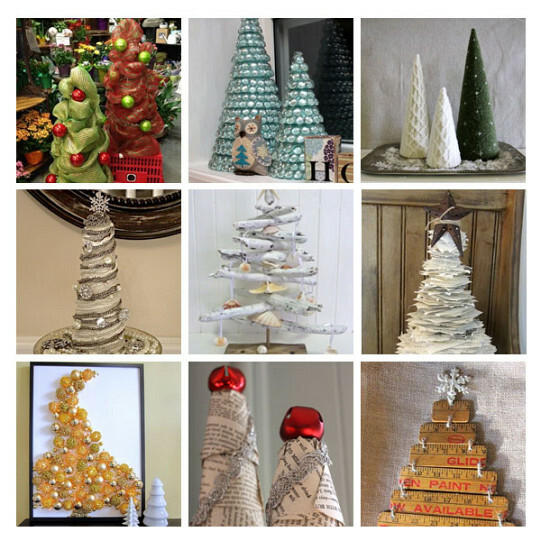 What might be the most inspiring is the DIY Christmas trees made from recycled materials. Environmentally responsible people always face the challenge of finding a sustainably sourced Christmas tree. On top of that, once the holiday has passed, they're stuck looking for a way to dispose of the tree. Do you buy a living tree, and replant it somewhere? Do you buy an organically grown tree, and then chip it into garden mulch? Well, quite a few clever DIY crafters and designers have published their alternatives, all of which involve making tree-shaped crafts out of old stuff that they already own. No, the results don't smell like pine, but heating up some pine essential oil in an essential oil diffuser offers an equally pleasing ambient odor. You don't need to be a professional carpenter to make them, either. Would you substitute any of these ideas for a real tree at your house? Book Page Trees: These "trees" are beautifully constructed stacks of discarded book pages, set in gavanized metal pots. A fantastic use for water-stained or otherwise unreadable old books that have been sitting in the attic. Tomato Cage Christmas Trees: For a large, almost life-size Xmas tree, try constructing one out of a tomato cage and decor mesh. Christmas Tree Wall Art: Mounting fallen branches on the wall, in the shape of a real tree (trunk and all), is a whimsical take on the traditional. Old Magazine Tree: Using simple origami folding techniques, you can turn a stack of old magazines into a glossy, flashy, totally unique X-mas tree. Christmas Tree Made from Repurposed Old Post Cards: If you have a stash of post cards sitting in your closet, they could become a big, fluffy-looking X-mas tree. Antique Wedding Dress Tree: Antique (or any, really,) wedding dresses are perfectly suited to become a seven-foot Christmas tree. Chaya Kurtz writes for networx.com.